While searching for a device to transform crude oil into liquid hydrogen, which he needs to run the Technodrome, Krang accidentally brings Mr. Ogg from Dimension Z to earth. Mr. Ogg has the power to transform anything into anything he wishes. While Mr. Ogg is in the Technodrome he discovers Shredder’s quarters. Shredder has a collection of antique vases. Ogg has a taste for old porcelain and eats all of Shredder’s collection. By the time Shredder finds him it is too late. Ogg wants to know where he can get more porcelain and that gives Krang an idea on how to get the Turtles back and get his formula for the oil. 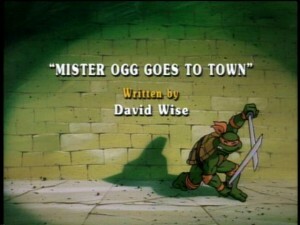 He tells Ogg that he would go get more porcelain for him, but they have been cast out by the Turtles. They are doomed to stay underground. Ogg feels bad for them and says he’ll get whoever it is that did that to them. Krang tells Ogg that if he can get a formula to trasnform oil into liquid hyrogren, Krang will tell him where he can get all the procelain he has ever wanted and he will also tell Ogg where the Turtles are so Ogg can do them in. Ogg agrees to do it. Ogg heads up to the surface to find the Turtles, and coincidently he finds them above ground. Ogg says that he will get them for what they have done to his friends. He starts setting traps for the Turtles, but they soon discover that Ogg can’t really harm them. Instead of setting deadly traps, he is using all the makings of a sundae to try to stop them. Michaleangelo finally gets fed up with Ogg after he throws the merry Turtle into an antique store. Miikey throws the nearest thing at Ogg, which happens to be a vase, and that is how they discover Ogg’s taste for porcelain. The Turtles know they have to stop Ogg before he turns New York City into one big sundae. They contact April and with her help they lure Ogg into a museum, thus, capturing thim. Meanwhile, Shredder, Bebop and Rocksteady seize an oil tanker and begin pumping the oil down to the Technodrome. Ogg gets free from the museum, but the Turtles and April realize that his transformations are only illusions. With the help of some fake procelain and the Turtles’ transporter, they trick Ogg into going back to Dimension Z. Krang and Shredder get away with stealing the oil, but in the end they discover that the formula that Ogg gave them does not work after all.